A feeling of uniqueness can easily be interpreted as arrogance and hubris, and at times, even rudeness. 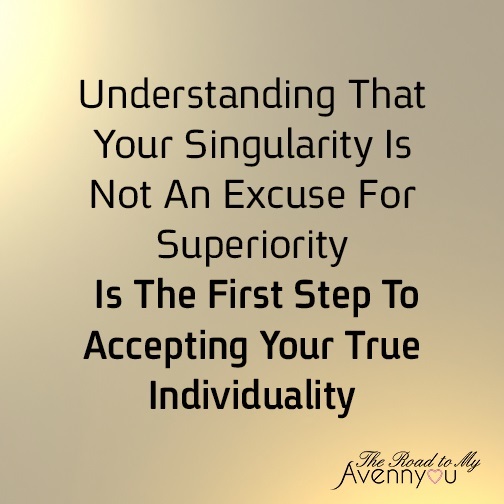 Understanding that your singularity is not an excuse for superiority is the first step to accepting your true individuality. Uniqueness doesn’t make us superior, just as excellence isn’t the key to being unique. 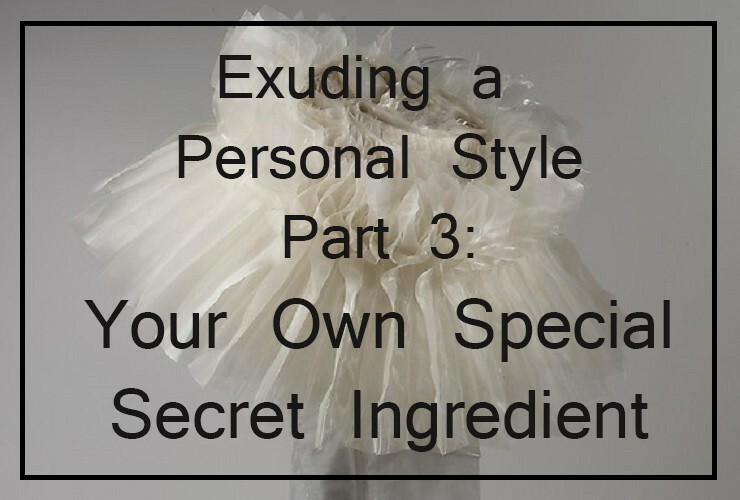 And though it is often an aversion to uniformity that drives us toward extreme means of self-expression, as discussed in Part 2 of this series, I believe that it doesn’t take too much to develop a singular personal style. I remember as a child disliking others mimicking my choices, be it clothes, school assignments, or behavior. It took me years, and no little irritation, to realize that as far as people are involved, no matter how hard we try, a replica can never even get close to duplicating something original. Our distinctive nature is one of nature’s greatest creations. Interpreting our own personal style is one way of accepting ourselves for who we are and of being unique – not an arrogant uniqueness but rather a uniqueness extracted from the special combination of everything that constitutes the "us” I discuss in That Inner Urge post. Everyone is unique just like the rest of us says Margaret Mead, and it is this search to realize our destiny, calling or self-fulfillment that allows us to actualize this uniqueness. The understanding that my uniqueness is not driven by a specific item I wear but rather from the combination of how I wear it, where I wear it, and my behavior and thoughts while I wear it is exhilarating. And at the same time it liberates us to share, inspire and openly exchange ideas, all the while appreciating the value of these interactions. 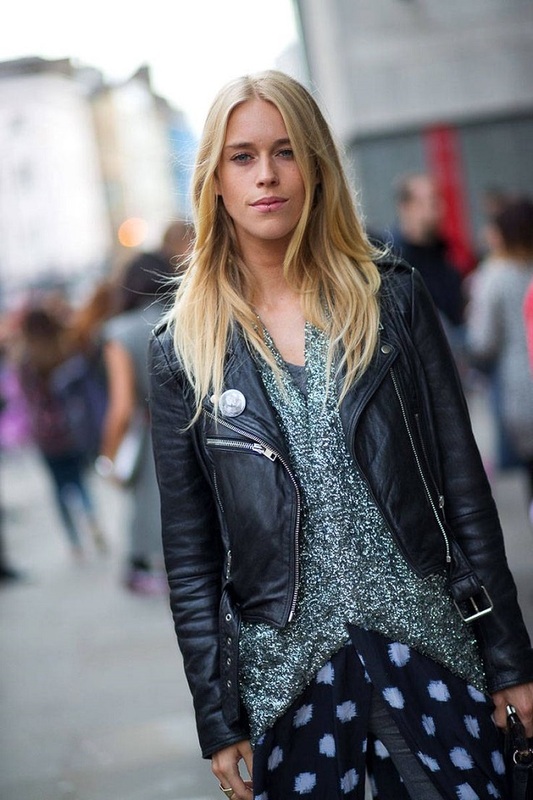 The images below are all great outfits consisting of a small, black leather jacket, each similar to the other, and yet each women wears it differently, with a different combination of colors, materials and even occasion. Some uplift it to a more elegant look, for others it is a more casual chic. Every woman has her own little secrets on how to look her best by beautifully highlighting her body, skin or hair color. It is not these secrets that make us special but rather our own way of implementing them and combining them to create an entire self-portrait. Dressing up is another way to exhibit what we know; another way for us to combine our inner with our outer being. There is no need to hold back the good stuff for fear of giving away our secret ingredient. We live in an era abundant in resources where information flows freely and steadily. Dressing up primarily for yourself is the best way to make you feel and look your best—assuming you are aware of this secret ingredient, the very essence of who you are —noticed and appreciated by like-minded, potential soul mates wherever they might be.